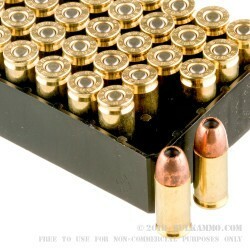 All 9x19 ammo manufacturers produce at least one type of “premium” self-defense ammunition. They all maximize their rounds to provide the best stopping power possible. However, those premium rounds come at a premium cost. With some high-end hollow point rounds, you’re paying extra for scientifically engineered rounds with special construction techniques and patented names and products. These are great rounds, don’t get me wrong. Yet, you may not want to pay a lot of money for something you don’t want to use at the range and for target practice. 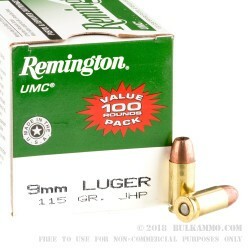 Remington UMC has the answer with these 9mm JHP 115 grain rounds. 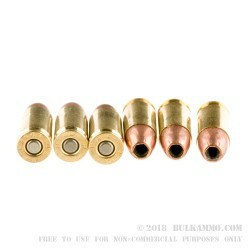 For anyone on a budget, or anyone who just simply doesn’t want to spend the extra money on “fancy” bullets, these rounds are the perfect fit. Yeah, but will they stop someone? Are they good for self-defense? Absolutely. 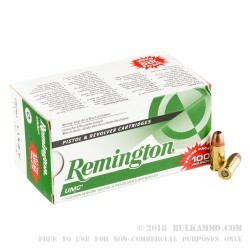 Remington has published the muzzle velocity of these rounds at 1145 fps from a 4-inch barrel. This was fast enough to have reliable expansion and produce about 335 lbs/ft of energy. (These rounds operated at normal, not plus, pressures.) In their tests, this round penetrated 12 inches of ballistic gel covered with 2” of layered denim. When the round was recovered, it had expanded to just over ½ inch and retained 114.2 grains of weight! That’s impressive for a “basic” hollow point.